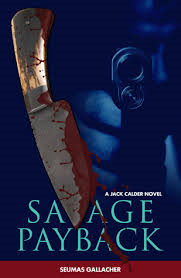 Savage Payback by Seumas Gallagher is a SGC publication, released in October 2013. Jack Calder and the ISP ( International Security Partners), are called in when a deadly bomb goes off in London's West End, taking out a slew of jewelry stores. This crack team of men and women begin putting the pieces together of how and why this happened. But before they can catch their breaths, the case takes on a personal tone. They begin to suspect that someone they know is behind this, but he's shadow. No one knows where he is and until now didn't know if he was even still alive. This is a guy trained as well as they are. Mix in two powerful crime lords that decide to join forces, and the team is in for one wild ride. Even though they have dealt with murder and death before, when all is said and done, none of them will ever be the same again. I believe there are two other books in this series, but you don't have to read those first. I haven't read them YET, and I still enjoyed the book. The story starts off with a literal bang and just never slows down. The attraction for me was that the plot was very well crafted. The author provided plenty of action without depending on that to carry the story. The reader bonds with the characters and starts to care about them. There are a few major kicks in the stomach along the way, and too many "near misses". The bad guys are pretty clever as well as ruthless and seem to always be one step ahead. But, never count out the ISP team. Jack especially takes the this case to heart. He becomes a beast in his drive for justice, HIS brand of justice. Believe me, you'll be cheering him on the whole way.